Cover up cuts: Soil-borne diseases can spread through a cut in the gardener’s finger, tetanus being the most common. A band-aid and gardening gloves are always advisable if you are aware of any skin cuts or abrasions and remember to clean new wounds thoroughly. Avoid breathing in spores and dust: Be careful of situations where fungal spores can be released, particularly where the contents have been warm or stored in enclosed spaces. Opening bags of compost, cleaning out a greenhouse and dislodging mould from containers are all likely to release spores into the air. Wearing a suitable face mask can help but making sure the area is well-ventilated and not breathing in any dust is also a sensible precaution. Beware of insects: Most insects in the garden are harmless. Even insects that can sting, such as bees and wasps, generally will not be a problem if they are left alone. But some children may be allergic to stings. Always keep epinephrine or other allergic reaction treatments on hand. If you live a region where ticks or other parasites are a problem then you need to take precautions during the summer months. See Barbara Pleasant’s article on preventing lyme disease from ticks for details. Wash vegetables and fruit carefully….and your hands! Although we think of organic fruit and vegetables as being healthy because they are not sprayed with pesticides they could have come into contact with bird or pet faeces and may carry diseases such as E. coli, listeria and salmonella. Washing in clean water is the best prevention particularly for things that are consumed raw such as salads and fruit. And remember! After you and the kids finish in the garden, always make sure everyone washes their hands. Be careful with compost: Composting can give off dust and spores which in extreme cases can cause respiratory problems such as asthma. Children who are known to suffer with asthma should avoid composting, or gardening or playing near the compost bin. Do not put cooked foods, meats and fish in the compost as this can attract rats, mice and foxes. If animals nest in the compost this could indicate that the compost is too dry, adding water should prevent this. Follow the same advice above for soil in respect of gloves and hand washing. Watch out for animal droppings: Soil can be contaminated, in particular, by toxocara-canis and toxoplasmosis from cat, dog and fox faeces, which present a serious health risk to children. Whether you have a pet or not you should regularly check the garden where children play and remove any faeces. Do not garden with children on areas known to be visited by these animals. Take measures to prevent animals from entering your garden where possible. As mentioned above, educate your children about this and get them to wear gloves and wash their hands after gardening. Only use well-composted manure to reduce the number of pathogens in it before you incorporate it into the soil and use gloves when handling it. Garden organically: Every few years more pesticides are banned as we discover the detrimental effects they have on human health. Pesticides and insecticides are not necessary if you learn to use natural methods such as companion planting to attract beneficial insects. Even though you may garden organically, NEVERnot allow children to eat soil from the garden. Some soils may contain relatively high amounts of lead or other residual as well as natural toxic substances that should not be consumed. Use grey water wisely: Water from your house needs to be used with sensible precaution in the garden to avoid diseases or pathogens – see our article on Using Grey Water. Be careful of hazardous plants, stakes and canes: Check for plants with spiny leaves or thorns, such as cacti, roses, yucca, hollies, or pyracantha. Do not plant spiny plants next to raised porches, decks, or steps where children might fall into them.Point out any potential hazards to children and fence off areas or plants that should be avoided. 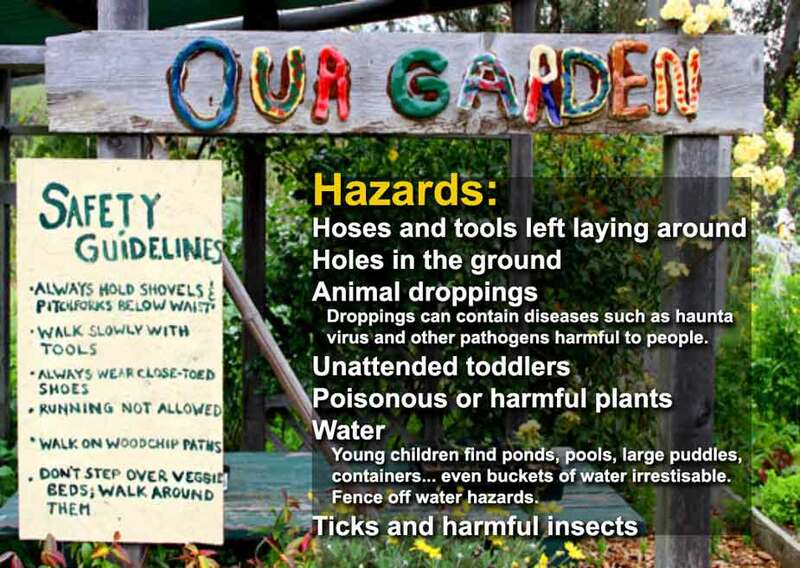 Remove dangerous plants, if necessary – especially if they are close to a play area. Also, getting poked in the eye by a bamboo cane or plant support can easily happen when bending over or turning around in the garden. A simple way to prevent such problems is to place a small upturned plant pot on the top of each cane which makes it stand out and protects you from the sharp tip. Check to see if any of your plants have poisonous berries, leaves etc. Continuously seed to child-proof your garden: You should NEVER have chemicals in the garden, but if you do,chemicals then make sure they are out of reach and out of sight, along with any sharp tools. Open water such as ponds and water butts should be fenced or covered and you should It’s easy to forget these safety measures if you don’t have children in your household but they are still important if friends or relatives with children visit occasionally. Nearly all human activity has its dangers and gardening is certainly a lot less hazardous than most. Eating an unwashed raspberry is hardly likely to kill you but a little precaution in other areas is worthwhile in order to keep it from becoming anything other than the healthy enjoyable activity it should be. Combining these simple safety measures with a strong immune system that comes from a healthy diet of fresh fruit and vegetables makes gardening one of the most health-bringing ways to spend leisure time. AND….ALWAYS BEWARE OF THE SUN. Read more about Sun Safety.